Caduceus Is a well known medical symbol picturing a winged rod with two winding snakes. Originally Caduceus was an astrological symbol of commerce and associated with the Greek god Hermes, the messenger, conductor of the dead and protector of merchants and thieves. Caduceus used nowadays often as a symbol for medical and health care organizations, because of a previous confusion with the traditional medical symbol "Rod of Asclepius". “Rod of Asclepius” is a different symbol representing only "one"" snake and never depicted with wings. 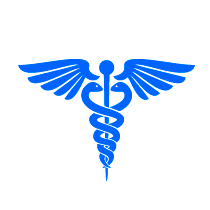 The modern use of the caduceus symbol established in the U.S. in late 1900s and early 2000s.